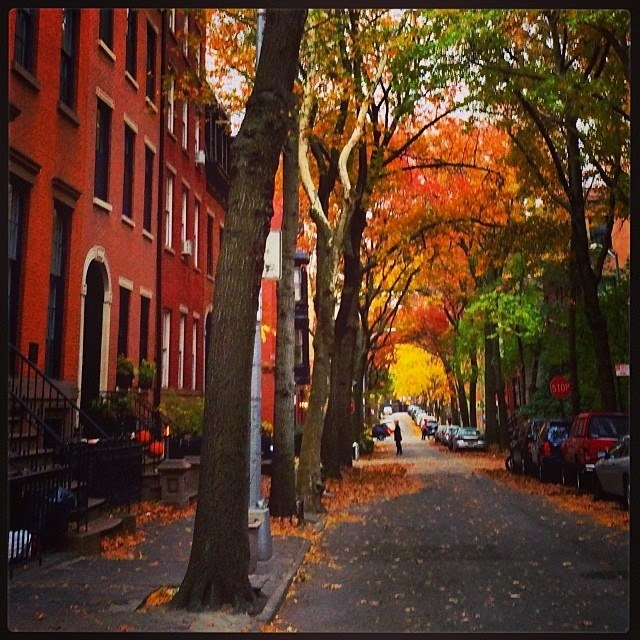 SUSAN ELIA MACNEAL: This Sunday's "Moment of Zen" is a photograph of our neighborhood in Brooklyn, taken by friend Andrea Vaszko of Bellandin Photography. It looks like a painting . . . what a lovely fall day. Good morning, everyone! Enjoy your Sunday! Is anyone doing anything fun today? I'm doing laundry and making soup to freeze. Very grown-up, but planning on going to the park this afternoon for a nice walk. Gorgeous moment of zen! Thanks for sharing it, Susan. I could use some zen right now. Fun today? Now that I have a decent scanner, I'm pulling out my Mom's old photo albums and scanning the wartime pics for Remembrance Day. My oldest grandson needs some pics of his forebears in uniform (Mom with with Canadian Red Cross, Dad in the Army). I'm having a great time. But sad and thoughtful too, of course. Love your fall pic, Susan. I couldn't quite get my thoughts together yesterday morning, Susan, but it came to me today what I felt when I looked at this photo. Like Joan remarked, it's very painterly--but it does more than present a pretty picture. It invites you in--you want to stroll down that street, explore the neighborhood, perhaps walk up to one of those doors and ring the bell and be invited in for a visit, a cuppa, a chat.